Would you like to own this beautiful Riad? If you are seeking the predictable, the average, the commonplace, then Dar Qawi is not for you. This is a house full of contrast and contradiction: Moroccan charm and idiosyncracy combined with distinctly cosmopolitan overtones, sumptuous dark mystery against sunlit clarity, generous spaces with hidden corners, chic style and laid back comfort. 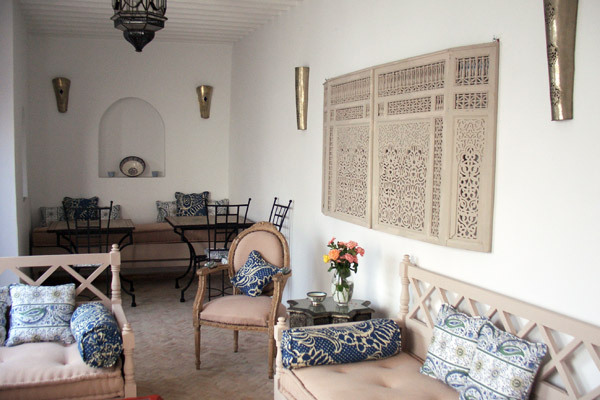 Interesting and eclectic, in a prime position within the bustling medina, and only a few minutes walk from the beach and the many wonderful restaurants and cafes, the polyglot owners, Paul and Kia, invite you to enjoy their beloved Moroccan retreat. The tinkling of an antique alabaster fountain welcomes you as you step from the bustling street over the threshold into a generous open plan salon/reading room adjoined by a small tea kitchen and a guest WC. The bedrooms, a double and a twin with their ensuite shower rooms are on the first floor as is the master suite which has an ensuite bathroom as well as a dressing room/nursery. Another flight of stairs leads you to the property's first roof terrace which is walled and completely private. It is overlooked only by a light and airy salon and a comfortable dining area. Next door to this is the fully equipped kitchen. There is also a separate laundry room with washing machine, an outdoor shower to cool off and a table and chairs for al-fresco eating. A second roof terrace has sun loungers and is dedicated entirely to sunbathing. The house comfortably sleeps up to six people and can further accommodate a child. All bedrooms have ensuite bath or shower rooms and Egyptian cotton linen, fluffy towels and robes and hair dryers are provided in each. The house is let as a whole and rates include breakfast and daily maid service. Our housekeeper is an excellent cook and is happy to prepare picnics, lunch or supper at very reasonable prices. Flowers, bottled water and basic provisions await guests and WiFi, satellite TV, DVD player, CD player, ipod dock, board games and books are provided for entertainment. Plenty of electric heating and warm blankets are available in the rare event of cool weather. If required, our local English property manager can arrange for taxi transport, cooking lessons, guided souk tours, visits to the hammam, camel or horse riding, quadbiking and kite surfing, paintballing, cookery or photography courses, trekking, boating or golf. Dar Qawi is a great place to stay for families, groups of friends or twosomes all year round. Whether you want to get away from it all and just chill out in the house, use it as a base from which to explore the local area and its historic sites or indulge in the many opportunities for action packed sports, here you can get into the Essaouira spirit. 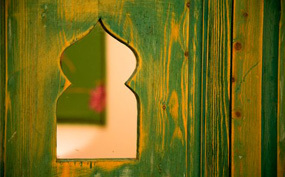 For more information about our Riad in Essaouira or to book, please contact us. "We stayed at Dar Qawi in August during Ramadan and had a fantastic time. The place was very well located and extremely well appointed with gorgeously decorated rooms. The breakfasts were massive and Zara came every morning to freshly prepare orange juice, fruit salad pancakes, croissants, eggs and bread and preserves. Dinner was a feast with tagines and pastilla and fruit tarts - all for a small price. We did camel trekking, surfing, fishing and tried the local hamman which we loved. 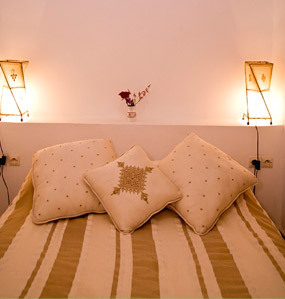 The riad was impeccably clean and well kept and having had a look in a few local riads is by far the best." "Dar Qawi was a delightful place to stay. 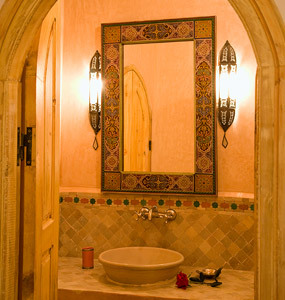 The rooms were beautifully decorated with eclectic Moroccan and contemporary furnishings, were light filled and peaceful. The courtyard and terrace areas are both fantastic." "A wonderful, stylish riad with a cook who serves the best food in Essaouira"
See and read more about Dar Qawi - Riad by the Sea in the West London Living review.